Canadian Space Agency astronaut Jeremy Hansen dangles over a mock-up of part of the International Space Station during a microgravity simulation in the Active Response Gravity Offload System (ARGOS) at NASA’s Johnson Space Center on Oct 24, 2017. You have to dangle before you can (space)walk. 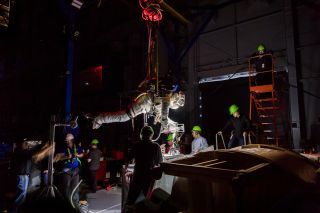 A new photo shows spacesuit-clad Canadian Space Agency astronaut Jeremy Hansen hanging over a mockup of part of the International Space Station (ISS), held aloft by a crane-like structure. Hansen was participating in an Oct. 24 microgravity simulation in the Active Response Gravity Offload System at NASA’s Johnson Space Center in Houston. Such practice has been quite useful recently. Astronauts aboard the ISS performed three spacewalks last month — one on Oct. 5, another on Oct. 10 and the last on Oct. 20. The first two extravehicular activities (EVAs) involved NASA astronauts Randy Bresnik and Mark Vande Hei; the third was performed by Bresnik and fellow NASA astronaut Joe Acaba. Astronauts have conducted 205 spacewalks to assemble and maintain the ISS, which has hosted rotating crews continuously since November 2000. During these EVAs, these spacewalkers have spent a total of 53 days, 6 hours and 25 minutes outside the station during these EVAs, NASA officials have said.